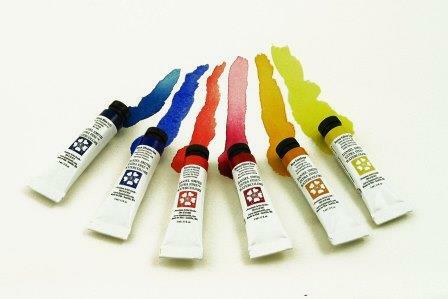 Daniel Smith Watercolours are now available in 5ml tubes. The 5ml range consists of 88 colours and includes some of the fabulous Primatek colours that are handmade with authentic mineral pigments and Quinacridones with their pure, intense colour combining the power of staining pigments with the luminosity of the transparents. They also have the more traditional favourites. The good news for retailers and consumers is that over 75% of the range falls into series 1 & 2 pricing categories, making them affordable and accessible to all. Cadmium Yellow Deep Hue - A rich, warm yellow with a golden glow. Light fastness: Light fastness: Very Good, Low Staining, Granulation: No, Semi-Transparent.